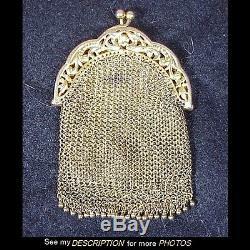 Antique Victorian 14K Gold Miniature Mesh Coin / Pill Purse 24.4 dwt 32 gram Solid 14K gold mesh Ladies Purse Pierced handle has a floral decoration Interior of the purse is lined with soft leather Very tightly woven mesh with a ball fringe Purse has a ring on one side perhaps to attach to a chatelaine Marked inside the handle. If you don't see it... Tags intact, not polished, altered, etc... Items with age typically display patina along with signs of use Be sure to view all the photos we take the time to process and display in a clear large format Thanks rjb670. The item "Antique Victorian 14K Gold Miniature Mesh Coin / Pill Purse 24.4 dwt 32 gram" is in sale since Friday, March 31, 2017. This item is in the category "Jewelry & Watches\Vintage & Antique Jewelry\Fine\Victorian, Edwardian 1837-1910\Other Fine Jewelry 1837-1910". The seller is "rjb670" and is located in Bristol, Connecticut.